Happy Halloween! How are you celebrating this year? I decided to make a Halloween-themed cake and knew from the start I wanted to make a two-tier cake and decorate it with spooky shapes. There was also only one flavour I wanted to use for the cake- pumpkin! I decided to pair the pumpkin with chocolate and the result was very tasty. This actually makes one layer; if you have a lot of people to feed and want a big cake, I would recommend doubling the above quantity (but then baking the cake in two tins). However I always find I need to adjust the quantities depending on how soft my butter is. Preheat the oven to 180C. Grease a 7 inch and a 9 inch loose-bottomed cake tin (I used Dr. Oetker's Cake Release). For the first cake, cream the butter and brown sugar in a large bowl. Add half a tin of pumpkin pie filling, or your stewed and mashed pumpkin. The mixture takes on a distinct orange colour - but the taste really isn't that strong if you are worried! Add the eggs. There are supposed to be three eggs - but I got my first ever double yolk! The yolks in that egg were a lot smaller so I figured the total amount probably equated to three. This is a good opportunity for me to remind you to break eggs into a cup or small bowl first, and then transfer them one at a time to your main mixing bowl - particularly if you are trying to separate eggs and only need the white, as if you go wrong, you only need to throw away the egg and not your entire cake mixture! The next stage is to fold in the flour. I decided to flavour this half of the cake with orange and chocolate, so I squeezed half an orange and added the juice. I also added cocoa powder and spooned the cake mixture into the larger tin. I repeated the same process for the second cake, using the other half of the tin of pumpkin, but without the orange juice or the cocoa powder. Dr. Oetker sent me this bag of chocolate chunks so I added the entire 100g to the cake mixture. The chunks are bigger than regular chocolate chips and hold up really well when the cake is cooked. Here is the mixture before the second cake went into the oven. Spoon into the smaller tin and bake both cakes for 25-30 minutes, testing with a skewer. If you are doubling the recipe for the bottom cake, I recommend baking that in two tins. The first cake - the chocolate and pumpkin cake - is ready and cooling. I made some chocolate buttercream and spread it on top of the cake. You need the top to be quite smooth as you are going to cover it with fondant. I then used Wilton orange gel to colour some white fondant and rolled it out on a large silicon mat I bought recently from Ikea. That made it very easy to turn the mat upside down and put the fondant on top of the cake without it breaking. I can see from this photo that I didn't mix in the orange particularly well, as the streaks were on the other side that was on the mat so I couldn't see them. They did end up being covered up by decorations though. I also placed the cake on a black cake board to fit the Halloween theme. Use a knife to trim off the excess around the cake and smooth the cake over the top. The smaller cake was quite deep as I used the same amount of mixture, so I sliced it through the middle. Here you can see the pumpkin has given the cake a slight orange colour and you can also see the chocolate chunks. I filled the cake with chocolate buttercream and spread more over the top. I wanted this cake to be purple as I thought the colour would go nicely with orange and was suitable for Halloween. Colouring fondant yourself is harder with a darker colour so I decided to buy some Renshaw Regalice sugarpaste in amethyst, which worked really well. I covered the cake, trimmed the edges and sat it on top of the larger cake. I saw these Dairy Milk Pebbles in the supermarket and when I came to decorate the cake I remembered they were in the cupboard. They are similar to mini eggs in that they are bite-sized pieces of chocolate in a crisp candy shell, but they are flat pebbles and come in purple, yellow and grey. Perfect for Halloween! I used them as decorations where the two cakes joined, as I think it can look quite untidy unless you have a ribbon or some other kind of decoration (or unless your fondant skills are perfect!). They were just the right size and the colours worked really well - and the chocolate is an added bonus when you cut a slice of cake. You can decorate the cake however you like. I had some small Halloween cookie cutters from the Wilton brand that I bought in America a couple of years ago, so I used these to cut skulls, bats, pumpkins and ghosts out of fondant, using the leftover white and orange fondant and also a packet of black fondant. I also fashioned some pumpkins by making a ball and pressing it down slightly, and using a knife to mark around the sides. The green stem on top is a little piece of leftover green fondant I had from another project. I also wanted something large to go on top so made a skull out of white fondant. It's quite easy just to press into shape with your fingers and use a knife to mark the teeth. I placed the different shapes around the sides of the cake and stuck them on with sugar glue, though you could also use leftover buttercream or even water. I used two of the grey pebbles (though they look brown in this photo) for eye holes in the skull and sat the skull and pumpkins on top of the cake. Here's my chocolate pumpkin Halloween cake in all its gory glory! The cake tasted very nice and was popular at work as I made it for a charity bake sale. The Dot Com Gift Shop sent me these products from their Halloween range to review. There is a set of paper plates, paper napkins and paper cups all with a trendy black and white skull print. I love the design and the items are good quality; if you are having a Halloween party check out the other items on the website. 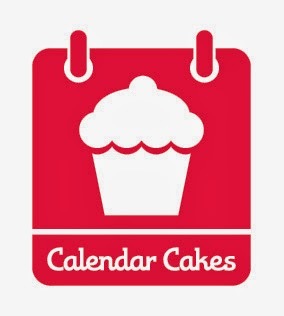 Regular readers of my blog will know that I like to share my bakes with other bloggers, and monthly topical challenges hosted by other blogs. So first I am sharing this with Let's Cook With Pumpkin, hosted by Simply Sensational Food. We Should Cocoa is the brainchild of Choclette from Chocolate Log Blog and she asks us to bake with chocolate and one other ingredient every month; this month the challenge is hosted by JibberJabber who has chosen vegetables. I hope they don't mind that my pumpkin came out of a tin! Finally the theme for this month's Calendar Cakes, hosted by Laura of Laura Loves Cakes and Rachel of Dollybakes, is Halloween so I am sending in this cake. WOW this looks stunning so very cute I love all the decorations and the cake looks amazing.Thankyou for sending it to lets cook with pumpkin event. What a construction! They must have been thrilled when you turned up with this at work. Thanks for linking it up with this month's We Should Cocoa. Such a fabulous cake - love the flavour and decorations. Perfect for Halloween! Oooh this looks delicious and cute, I have yet to delve into the world of fondant but your baking is starting to get me intrigued. Ooh, that skull on top looks properly spooky Caroline. The cakes sound really tasty. 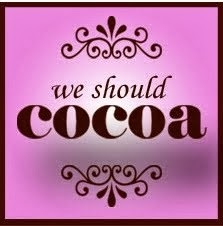 Thanks for linking it to We Should Cocoa.